Video: Reporter's Notebook: "County takes fight against oil into own hands"
Program Note: Watch Randi Kaye's full report tonight on AC360° at 10 pm ET. Randi Kaye is in a coastal dune lake east of Destin, Florida where they are bracing for oil to come ashore and taking matters into their own hands. The county and tourism boards- not BP- are busy building sand berms to try to keep oil out of their lakes. 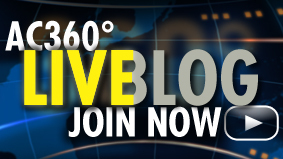 See Randi's full report tonight at 10pm ET. 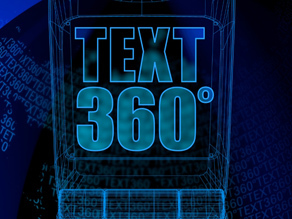 Tonight on 360°, Anderson continues to report live from Louisiana on the Gulf oil spill. Questions remain over just how much oil is leaking into the water. We'll talk it over with an expert. Plus, a researcher says he has proof underwater oil plumes. You'll also hear from actor Edward James Olmos, who's best know for roles in "Battlestar Gallactica" and "Stand and Deliver". But he's also a longtime activist and he's fired up about the oil spill. Evening Buzz: How Much Oil is Still Leaking Into the Gulf? Oil pools near a boom alongside Cat Island near Grand Isle, Louisiana. About 466,000 gallons or 11,100 barrels of oil are now being collected by BP after it placed a containment cap on the ruptured Gulf well last week. But how many barrels are still leaking? BP won't say. Keep in mind, last week officials admitted that "cut and cap" work could have increased the flow of oil by as much as 20 percent. Plus, three of four vents on the cap are still open, allowing oil and gas to leak out. Tonight Anderson will talk with an engineer at Purdue University who questions what BP is saying to the public. We're keeping them honest. Coast Guard Adm. Thad Allen, who is overseeing the government's response to the spill, said today it will take "years" to clean up the oil. 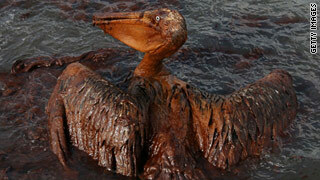 "We're no longer dealing with a large, monolithic spill. We're dealing with an aggregation of hundreds of thousands of patches of oil that are going a lot of different directions. And we've had to adapt, and we need to adapt to be able to meet that threat," Admiral Allen said at a news conference at the White House. Randi Kaye has a report tonight from Destin, Florida where city officials aren't waiting around for BP to take action. Tar balls are already washing up on shore. But BP hasn't shown up. There's also an oil sheen nine miles off the coast. But again, BP hasn't shown up. Destin leaders are taking their own steps to protect their beaches, including 15 rare coastal dune lakes. We'll show you what they're doing. In Louisiana, BP announced today it will give the state $60 million to start funding the $360 million cost of six berms to protect the barrier islands. "We understand the importance of this to Louisiana and the parishes, cities, towns and our responsibility to make sure that that funding is made immediately," Robert Dudley, BP Managing Director said this afternoon. Plaquemines Parish President Billy Nungesser welcomed the news. He met with Dudley and others today about the berm project. "It will give us a fighting chance and together we're gonna win this war," Nungesser said. We'll have more with Nungesser tonight on the program. Anderson will also have more of his exclusive interview with five men who survived the Deepwater Horizon rig explosion that led to the spill. Editor's Note: this is the FIRST time any group of the survivors has spoken out – and done an interview. This exclusive interview provides the most detailed account thus far of exactly what happened on the doomed rig that day – AND what happened in days and weeks leading up to it – that may help explain why this all happened. See the full interview tonight at 10 pm ET. Matt Jacobs scrambled to the lifeboat deck, and hopped in a lifeboat. He was the second person inside. He screamed for co-workers to jump aboard. A second explosion rocked the rig. The lifeboat, still suspended in the air, went into a free fall of about 3 feet. "Here I am on a lifeboat that's supposed to help me get off this rig,"
Jacobs thought. "And I'm gonna wind up dying." "It's going through my mind," he said, "I'm never going to see my family again." Eleven men died in the disaster, and 49 days have passed since the explosion. Now the survivors are telling their stories. Jacobs is one of five survivors who talked with CNN's Anderson Cooper. Watch "AC360" tonight to hear their harrowing tale of that day and how they got out alive. 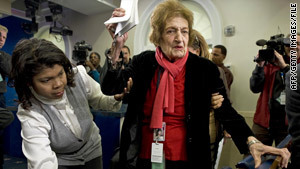 Hearst correspondent Helen Thomas was the longest-serving White House journalist. It was the spilled lamb juice that endeared Helen Thomas to me. We had a mutual friend, Fran Lewine, who I knew as an assignment editor and field producer in our Washington bureau. For many years before joining CNN Fran was a White House correspondent for the Associated Press. Her chief competition often was Thomas, who reported for United Press International. They traveled the world together and were two of the women who broke down barriers that discriminated against women journalists in the nation’s capitol. Fran honored me for several years with invitations to the next-day performance (casual dress for the audience, as opposed to formal wear the night before) of the annual show by the Gridiron Club, a costumed song-and-dance send-up of Washington politics and personages by many of the leading print journalists. Helen often was a featured performer while Fran sang in the chorus. The treat afterwards was being Fran’s guest at a dinner hosted by Helen at her favored D.C. restaurant, the Calvert Café, perhaps better known as Mama Ayesha’s. Randi Kaye is in Destin, Florida where locals are bracing for oil to come ashore. They are aggressively building sand berms to try and protect their coast from the oncoming oil. 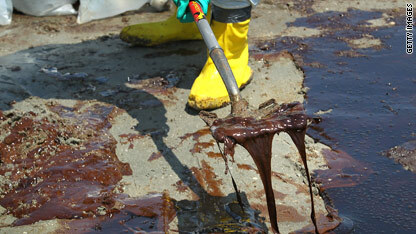 Do you have questions about the spread of the oil spill to Florida? What the current condition of the beaches are? To help readers navigate the legal landscape surrounding BP's mammoth oil spill (or "oil spew," as some argue it should more properly be called) in the Gulf Coast, I have looked into some of the law-related questions and statements that keep surfacing as the press and bloggers keep up with the crisis. I rely mainly here on an interview with Christopher B. Kende, an international insurance law specialist at the firm of Cozen O'Connor. Kende also teaches attorneys about the legal issues stemming from the Deepwater Horizon oil spill as a lecturer for HB Litigation Conferences. If your own questions don't happen to be among the FAQs I address here, write a comment below or email me, and I'll try to post responses in a follow-up article. It will take years to completely clean up the damage from the Gulf of Mexico oil spill disaster, Coast Guard Adm. Thad Allen, the federal government's response manager for the oil disaster, said Monday. "Dealing with the oil spill on the surface is going to go on for a couple of months. After that it'll be taken care of," Allen said in response to a reporter's question at a White House briefing. "I agree with you, long-term issues of restoring the environment and the habitats and stuff will be years." The total amount of crude being collected from the ruptured undersea well responsible for the disaster increased Sunday to roughly 466,000 gallons - or 11,100 barrels - according to estimates from BP and Allen. ON NORTHSHORE BAY, Louisiana—It’s difficult to imagine the scale and depth of the back breaking work that lies ahead for Louisiana and the other Gulf states until you spend some time on the water with people whose job it is to protect the environment. Along with CNN Photojournalist Orlando Ruiz, I took a five hour trip to look at only a few of the hundreds of marsh islands that dot the Mississippi Delta country at the very tip of Louisiana. Taking us on the tour was the Louisiana Department of Wildlife and Fisheries, custodians of the estimated 15,000 miles of coastline that make the state unique. I took the trip in preparation for a planned CNN Special Investigations Unit report that later this week on AC 360° that will examine the Minerals Management Service. The MMS is an agency within the Department of Interior that has proven to be a key player in the oil spill crisis, even though with all the coverage given the spill, few Americans know of the agency and fewer still know what it does. The MMS, as one oil industry expert told me, is the nation’s landlord of all of the oil and gas tenants in the Gulf. The latest count is that there are something like 4,000 or so oil or gas platforms and the MMS deals with all of them. Like a landlord, the MMS takes in rent—the royalties that companies like British Petroleum pay to the U.S. treasury for the privilege of operating either close in or deep water drilling platforms. And the MMS also has a statutory duty to inspect those rigs, take careful note of the safety and overall conditions of the rigs and, if necessary, deny permits to drill or continue drilling. But if the MMS fails in its job, or as Interior Secretary Ken Salazar said in late May, it has a “cozy” relationship with the oil companies that it’s supposed to regulate, then you can see the real world impact on the islands we saw near the mouth of the Mississippi River. Oil began arriving at NorthShore Bay in Louisiana two weeks ago, according to the Wildlife and Fisheries Department. On our tour, you could see miles and miles of booms laid around the marsh islands. But under a blazing sun, it was also clear that most of the booms had become fully saturated. 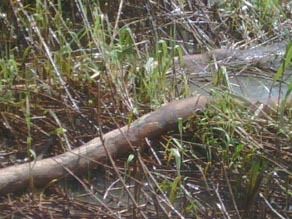 Oil was not only seeping into the roso-cane reeds that dominate the islands but it had also broken through the containment booms. 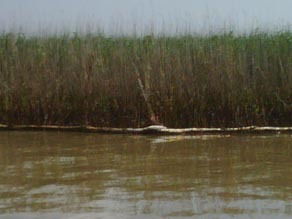 The roso-cane reeds closest to the edge of the water had already been destroyed. Small wisps of green leaf on the very top of the reeds were the only visible sign of life. Sgt. Ray Champagne of the Wildlife and Fisheries began telling his headquarters that the booms had become saturated and that new ones needed to be brought out to the islands. He gave the exact coordinates but soon gave up and told his superiors that every boom he saw needed to be replaced. Sgt. Champagne also had one other piece of unhappy news. As we rode along the Mississippi River, he pointed out that the water level was unusually high. 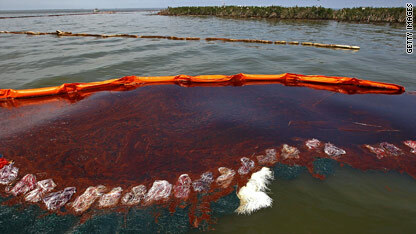 By the end of the month, he added, the water is bound to decrease, making oil contamination that much more certain.